MAKATI CITY – Climate justice activists, composed of civil society groups and people’s organizations, held a concerted action today at the Bank of the Philippine Islands (BPI) Ayala Triangle to protest the Ayala-controlled bank’s planned financing of a new coal-fired power plant in Atimonan, Quezon. The said bank – housed by the Philippine Stock Exchange building where many other commercial banks are listed as coal project investors – was also slammed by climate justice activists for its continued financing of other coal projects. The protesters brought tall, inflatable, "dirty, costly, and deadly coal demons", which served as a backdrop to a huge image of Ayala Group CEO Jaime Zobel de Ayala, to highlight the temptations of an obsolete fossil fuel to private banks such as BPI. The protest action is part of Piglas Pilipinas, a nationwide campaign for the Philippines to break free from fossil fuels. Its main call stressed on the importance and urgency of divesting from coal and other fossil fuels. “Coal is not the answer to our country’s energy needs,” said Philippine Movement for Climate Justice Coordinator Ian Rivera. “Contrary to the coal industry’s persisting propaganda, coal is neither cheap nor clean. In fact, it has time and again been proven to be dirty, costly, and deadly,” said Rivera. According to Rivera, coal is the culprit for the health problems suffered by communities that host coal-fired power plants. He cited a Harvard study conducted in the Philippines which found an annual estimate of 2,410 deaths as a consequence to exposure to pollution emitted by coal plants. Rivera stated that residents of communities that host these coal plants often suffer from lung, cardiovascular, and skin diseases. He also added that due to soil and water contamination from coal plant chemicals, the residents’ livelihood is often left destroyed. “Coal is also deadly not just for local communities but for the rest of the world,” continued Rivera. “The burning of fossil fuels, coal being the worst of them, is the lead contributor to carbon emissions that aggravate global warming, which we know to be the primary cause of stronger typhoons, longer droughts all over the planet, and other forms of ecological disasters,” he said. “Coal is, most of all, expensive – with most of its costs externalized and paid for by society at large,” said Rivera, citing huge economic losses from the environmental, health and livelihood destruction caused by the extraction and utilization of coal for power generation, and the establishment and maintenance of coal facilities. Rivera stated that the coal industry is now being outstripped by new technologies that make cheaper solar and wind power, citing a renewable energy sector that continues to drive down its prices. “Clean and sustainable energy sources are steadily making the continued usage of coal not only an obsolete choice, but also an inexpedient one,” said Rivera. “Investors and depositors of BPI should be advised against coal financing for its reputational risks. Most alarming of all, however, are the investment risks that continued coal financing poses. As our country, along with the rest of the world, moves towards renewable energy sources, coal assets will be nothing more than stranded assets in the future,” warned Rivera. According to research conducted by the climate justice activists, BPI is invested in presently operating coal plants, such as the SEM Calaca in Batangas, Team Energy Pagbilao in Quezon, Cebu Energy Development Corporation and Toledo Power Corporation in Cebu, and GNPower Mariveles in Bataan. The group of climate justice activists stated that BPI also has plans to invest in the coal pipeline, particularly in the Masinloc Expansion Project in Zambales, in the Pagbilao Energy Corporation in Quezon, the GNPower Dinginin in Bataan, and GNPower Kauswagan in Lanao del Norte. Other coal-fired power plants have not disclosed their investors. The protest at the Makati central business district is part of the Reclaim Power Global Wave of Actions for a just energy transformation for the entire month of October. "The science of climate change is unequivocal, it's undeniable, and so now, action to transform our energy system is urgent and must be done immediately,” said Asian Peoples’ Movement of Debt and Development (APMDD) Coordinator Lidy Nacpil. “The energy sector produces over 35% of all climate pollution caused by humans each year, mainly from the extraction and burning of fossil fuels like coal, oil and gas. According to the latest numbers from the UN, over 80% of all remaining fossil fuels like coal, oil and gas will have to remain unburned if the world is to avoid extremely dangerous climate change,” emphasized Nacpil. "Reclaim Power is about demonstrating that while the current energy system fails on so many levels, including its failure to resolve the energy poverty of 1.2 billion people in the world who continue to have no access to any electricity, we have solutions using renewable energy technology that can decentralize power production and actually get it to all people in a democratic, people-controlled way," explained Nacpil. “We need to ensure community and public control of our energy systems, to ensure that people’s access is prioritized over profit,” concurred 350.org Digital Communications Campaigner and Coordinator Chuck Baclagon. “The technology to provide energy to all of humanity without burning the planet already exists. Instead of continuously giving handouts to dirty energy companies, what we need now is to direct public – and private – finance and subsidies to encourage 100% renewable and clean energy,” Baclagon concluded. MAKATI CITY – The Department of Trade and Industry (DTI) is set to showcase an annual display of micro, small and medium enterprise (MSME) excellence by bringing the best and finest products from Eastern Visayas and Bicol Regions for the Bahandi Eastern Visayas and OKB-Gayon Bicol Regional Trade Fairs on October 4 and 5, respectively, at the SM Mega Trade Halls 1 and 2, SM Megamall. As part of Marketing, one of the seven-point strategy (7Ms strategy) advocated by the Department, DTI is helping MSMEs penetrate the mainstream marketing through trade fairs. “With MSMEs being the backbone of the Philippine economy, it is important that we find ways to integrate the sector to bigger value chains, either in the public or the private sectors. Empowering MSMEs can only mean significant growth that is powered by ever smarter Filipino entrepreneurs, ready to participate in local, regional and global marketplace,” said DTI Secretary Ramon Lopez. DTI-Regional Operations Group Supervising Undersecretary Zenaida Maglaya explained that providing platforms for MSMEs to market their products in events such as trade fairs will test its marketability for bigger markets. “Participation in Trade Fairs provide MSMEs an opportunity to test their products for bigger markets and beyond,” Maglaya said. These MSMEs, according to Maglaya, have been assisted by DTI through Negosyo Centers, Shared Service Facilities (SSF), One Town, One Product, Kapatid Mentor ME Project, SME Roving Academy, among others. “By enhancing MSME products through DTI assistance, we are confident that their products would be market-acceptable, and supported locally and globally,” she said. The Bahandi Trade Fair, through the DTI-Region 8, will be celebrating its 20th year and will open the annual 5-day exhibit and selling fair of the best products from the six provinces of Eastern Visayas on October 4-8, 2017 at the Megatrade Hall 1, Mega B, SM Megamall. Under the theme, “Breaking Grounds for Borderless Markets,” the trade fair is aligned line with the Philippines’ hosting of the ASEAN Summit, promoting participation of MSMEs in the global value chain. The Eastern Visayas trade fair will also feature products of MSMEs who were victims of Typhoon Yolanda in November 2013. MSMEs were assisted by the Department to get back in operation, supporting them through learning, marketing assistance, product designs and innovations. A total of 132 MSMEs – 48 are from Leyte, 18 from Southern Leyte, 8 from Biliran, 28 from Samar, 10 from Eastern Samar, 20 from Northern Samar – from the processed food, and homestyle and wearables sector, and other products are expected to join the fair. The trade fair is in coordination with Regional Development Council - Region 8, Department of Tourism, Tacloban Entrepreneurs Associated Marketing Cooperative (TEAM-COOP), GREAT Women Project 2, and Negosyo Center. On the other hand, OKB-Gayon Bicol, now on its 21st year, is expected to banner Bicol Region’s fine products and tourism potentials ranging from wearables and homestyle products, processed foods, ceramics, furniture/ furnishing, fine jewelry, and other products. The trade fair will run on October 5-8, 2017 at the Megatrade Hall 2, SM Megamall. Joining this year’s OKB-Gayon Bicol fair are 141 MSME exhibitors from all over the region – forty (40) from Albay, 15 from Camarines Norte, 22 from Camarines Sur, 25 from Catanduanes, 11 from Masbate, and 28 from Sorsogon. It will feature 32 new entrepreneurs that are provided full marketing assistance and 255 new products resulting from DTI-Region 5’s product development activities. The longest running DTI-organized regional trade fair is a convergence activity of OKB Association, Inc. in partnership with DTI-Region 5, DOT-Region 5, Air 21 and Bicol Harvest/Bicol Artist. CAMP LUKBAN, Catbalogan City – The 8th Infantry (Stormtroopers) Division, Philippine Army led by Maj. Gen Raul M. Farnacio AFP, Commander 8ID conducted the Closing Ceremony of the Philippine Army Candidate Soldier Course Class 462-2017 consisting of 127 soldiers at the 8ID Jungle Base, Barangay Fatima, Hinabangan, Samar today. Out of 135 candidate soldiers who entered on June 1, 2017, only 127 brave and dashing Candidate Soldiers graduated and graced by Hon. 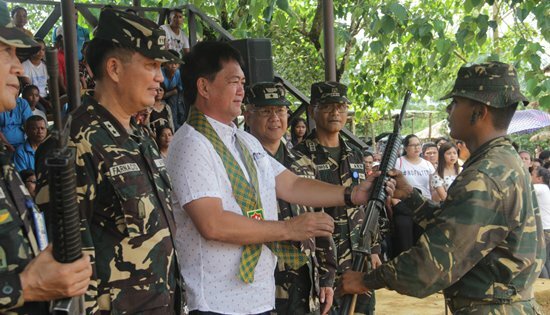 Marcelo Ferdinand A. Picardal, the Acting Governor, Province of Eastern Samar as the Guest of Honor and Speaker who further led the ceremonial entrustment of firearms, distribution of certificates and individual achievements. The majority or 81 new privates came from Samar; 21 from Leyte; 8 from Luzon; and 17 from Mindanao. On their educational profile, 23 of them are college graduates; 45 are college level and 59 are high school graduates with skills training from TESDA. Likewise, Maj. Gen. Farnacio said, “The soldier above all other men is required to practice the greatest act of rigorous and rigid training. Put emphasis on the sacrifices you have made and love your profession. What you are, inside or outside the camp, even if you are not in uniform, is the extension of you being a soldier. To the 127 new soldiers, focus on your job. Help the national government in their effort in Mindanao and make us proud”, Farnacio added. Maj. Gen. Farnacio extends his warm appreciation to the stakeholders who untiringly committed and supported the attainment of a just and lasting peace in the region. The 8ID is still accepting applicants for Candidate Soldier Course for CY 2017. 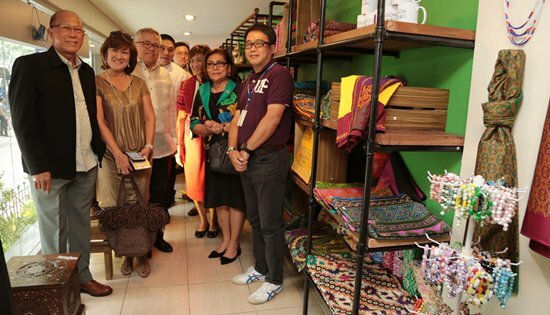 MAKATI CITY – The Department of Trade and Industry (DTI) launched the Bangon Marawi Product Store today (29 September) at the Ground Floor of the DTI Bldg. along Sen. Gil Puyat Ave. in Makati to introduce Maranao products to the public as well as provide livelihood assistance to internally displaced persons (IDPs) from Marawi City. This follows Administrative Order No. 03 of President Rodrigo Roa Duterte mandating the creation of an inter-agency task force that would implement the recovery, reconstruction, and rehabilitation of Marawi City and other affected localities. “While our government is working tirelessly to give them respite in the wake of the tragedy afflicting their city, DTI has come up with its own way to help our Mindanao countrymen” Trade Secretary Ramon Lopez said. “Given that the Maranaos are inherently traders, we thought it appropriate to find a way to help them showcase their products and bring them to the mainstream market,” Lopez added. Products on sale include brasswares, wooden furniture, wearables, Maranao woven products, jewelry, fashion accessories, and Maranao native delicacies. The sales and proceeds of the Bangon Marawi products will go to help the Maranaos and others displaced by the conflict in Marawi. This project is done in partnership with the Bangsa Moro Federal Business Council, the Tugaya Local Government, the Muntinlupa Local Government, and Magsaysay Shipping and Logistics. Also at the launch were Defense Secretary Delfin Lorenzana (leftmost) with wife Edith Lorenzana (2nd from L), Undersecretary Rowel Barba (rightmost), Undersecretary Nora Terrado (3rd from R) with other DTI and other officials. DTI will carry the Bangon Marawi products in all Go Lokal! stores nationwide. CALBAYOG CITY – Samar First District Engineering Office will undergo a “Walk-the-Line” Inspection of the road sections covered by the district with a total length of 741.609 kilometers conducted by the Inspectorate Team lead by Engr. Roy P. Mate from the Bureau of Maintenance, Road Condition Monitoring and Evaluation Division (RCMED) on September 22, 2017 to October 15, 2017 to assess compliance of the District Office to the provisions of Department Order 41, series of 2016 regarding the Amended Policy Guidelines on the Maintenance of National Roads and Bridges. DPWH in accordance with its mandate to maintain national roads and bridges being a paramount priority issued a Department Order to improve the maintenance service delivery to the public, the Regional and District Engineers shall strengthen their maintenance unit to keep all national roads and bridges safe and convenient to the travelling public at all times. In this regard, the Inspectorate Division of the Bureau of Maintenance, this department will conduct assessment, the physical condition of national roads and bridges per semester. SFDEO under the leadership of District Engineer Alvin A. Ignacio and supervision of Maintenance Head Engr. Ramon Calagos make sure that all the relevant documents for the Inspectorate Team’s reference are ready and updated. Maintenance field workers do their regular routine of cleaning the area, cutting grasses and vegetation, canal declogging, patching path holes, cracks resealling, issuing notice of obstruction and no parking signs maintained. Maintenance Point Persons Engr. Ronale Pelotos (Caglanipao-Carayman Area), Engr. Jeremias Lim (Calbayog-Catbalogan Area) and Engr. 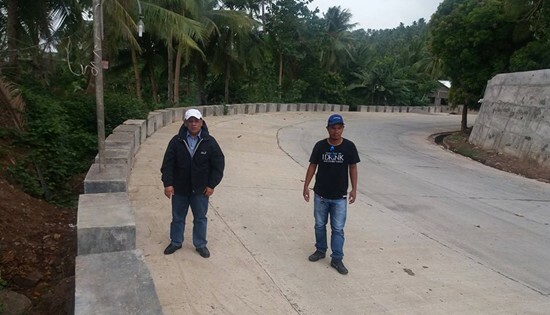 Mario Balane (Calbayog-Catarman Diversion Road) monitor their respective areas for activities and implementation of immediate action of road defects and obstructions. The passing rate for the assessment of roads by the team is pegged at 75%. QUEZON CITY – Center for Energy, Ecology, and Development (CEED), an independent, non-profit, non-stock, think-do institution engaged in issues of the environment, energy, and development in the Philippines, expressed its support for the pronouncements on an energy policy shift as stated by the Climate Change Commission (CCC) during the commission-spearheaded National Energy Policy Review program held on September 28, 2017. De Torres cited numerous data that hold the combustion of fossil fuels, especially of coal, responsible for being the largest human source of carbon dioxide emissions. Quoting a 2016 study made by the Joint Research Centre of the European Commission, De Torres stated that coal combustion was responsible for about 46% of carbon dioxide emissions from fossil fuel combustion, with 31% of which is emitted from coal-fired power plants. “This makes a proactive shift to cleaner and more sustainable energy sources imperative – especially as the Philippine renewable energy sector has been making great strides in driving down its costs and improving its technologies,” said Buenaagua. Aside from the reduction of carbon emissions and prevention of further environmental destruction as caused by tapping into renewable energy sources, Buenaagua also cited significantly lowered electricity prices offered by a sprouting renewable energy market – prices that are projected to hit as low as below P5 per kWh. Philippine delegation for the 2017 Philippine Coconut Roadshow to the United States. MAKATI CITY – Department of Trade and Industry through its Export Marketing Bureau (EMB) and Philippine Trade and Investment Centers (PTICs) in the United States recently concluded the 2017 Philippine Coconut Roadshow held from 6 to 24 September 2017 in key cities including Los Angeles, Colorado, San Francisco, Maryland, and Washington, D.C.
“We see the increasing healthy, non-GMO, and gluten- free lifestyle of the American market as a window of opportunity for our exporters to promote their products as well as showcase the Philippines as an ideal source for coconut-based products,” said DTI Trade and Investments Promotion Group Undersecretary Nora K. Terrado. DTI supported 17 Philippine exporters enrolled in its Regional Interactive Platform for Philippine Exporters Plus (RIPPLES) program to extensively promote coconut oil and coconut-based products, including food, cosmetics, and personal care items to the huge US market. Together with key officials from the United Coconut Association of the Philippines (UCAP) and Virgin Coconut Oil Philippines (VCOP), the Philippine Trade and Investment Centers in the United States (Washington, D.C. and San Francisco) assisted and organized business meetings between American and Philippine companies for potential partnerships that seek to enhance and expand exports of Philippine coconut-based products to the United States. The group also met with US doctors and scientists that have in-depth knowledge on the benefits of coconut oil. The group participated in the 50th ASEAN Anniversary Forum organized by the ASEAN Trade Commissioners in partnership with the Port of Los Angeles. The meetings with leading importers and retail chains in Los Angeles and San Francisco generated market leads and market access platforms for the participants. 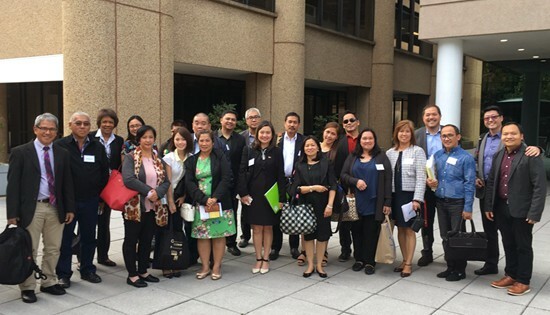 For the Washington, D.C. leg, the Philippine Companies met with the US Department of Agriculture, the Organic Trade Association, the US–Philippines Society, Foodshowcase, the USA Halal Chamber of Commerce, and Registrar Corporation. Participating exporters and Philippine officials were also briefed on the US Generalized System of Preferences (GSP) Program, including identifying coconut products that could benefit from GSP treatment. Meetings held in Washington, D.C. highlighted the importance of trade policy issues when exporting to the United States, including compliance to US food safety regulations, labelling, and other non-tariff measures. From 14 to 16 September, the delegation held a dialogue with several US companies during the Natural Product Expo East held in Baltimore, Maryland, considered as the East Coast’s leading trade show in the natural, organic, and healthy products industry. The delegation had a chance to exchange views on how to further promote and increase awareness to American consumers on the health benefits of coconut oil. Participating companies include Amazing Foods Corp, Chemrez Technologies, Inc., Coco Plus, Coco Veda, Coconut Cures, Dignity, Eau de Coco, Franklin Baker Company of the Philippines, Galo Organic and Naturals, Greenlife Coconut Products Philippines, Inc., Hancole Corp., Marinduque Land Corporation, Pasciolco Agri Ventures, Nuco/ProSource International, Inc., Wellness Care International Inc., and Tongsan Industrial Development Corporation. DTI’s Coconut Roadshow to the United States is in partnership with the Philippine Coconut Authority (PCA), an agency committed to promote the growth of the coconut industry. David P. Adongay Jr., (wearing black jacket) District Engineer inspects the on-going widening along Naval-Caibiran Cross Country Road (NCCR) with a construction budget of P37,418,424.94. Adongay reported that the project is being fast-tracked to finish the project on or before October 8, 2017. As of August 30, 2017, it has an accomplishment of 58%. NAVAL, Biliran – Engr. David P. Adongay Jr., District Engineer of Biliran District Engineering Office (BDEO) conducts inspection around the district on August 16, 2017 together with Engr. Ginisar M. Romero, Engineer II. 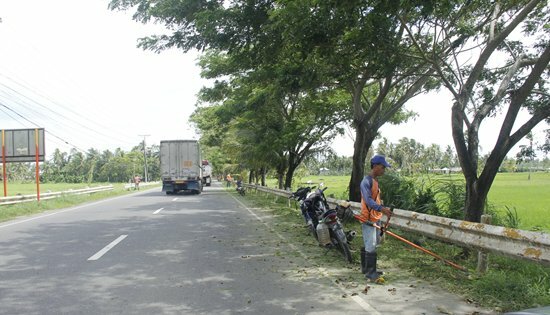 The first project inspected by DE Adongay is the substantially completed Asphalt overlay along Naval-Caibiran Cross Country Road with a construction cost of P33.322M. The project entails the application of asphalt overlay on existing concrete pavement with minor corrections with a width of 6.10 m. and a thickness of 50 mm covering an area of 7.316 lane km. According to Adongay, application of a Reflective Thermoplastic Stripping Materials will be the last activity of the project. The completion of this project will provide a smooth riding surface for the traveling public as well as provide convenience in transporting agricultural and aquatic products to market centers. Construction of Drainage along Biliran Circumferential Road is another project inspected by DE Adongay. The project is still on-going upon DE’s inspection. Major scope of work of the project is the construction of both open drainage on some sections and covered drainage on another section with a total length of 1,860 ln.m. It is to be constructed after a 3.05 m. widened shoulder. Adongay reported that the project has already 58% accomplishment as of August 30, 2017 and is target to be completed on October 1, 2017. The completion of this project will provide a drainage structure that will contain runoff water from the mountain sides during rainy days which will prevent flooding along the National Road thereby preventing its deterioration. The district engineer also took time to inspect the on-going Rehabilitation of Damaged Paved National Road along Naval-Caibiran Cross Country road (NCCR). Adongay said that the major scope of work of the project is the replacement of damaged concrete pavement to new concrete with a construction budget of P1.457M. “The project was prioritized because of the significant cracking along the above section which when left unattended might cause vehicular accident,” said Adongay. Adongay reported that as of August 30, 2017, the project is already completed. The last project inspected by DE Adongay is the Widening along Naval-Caibiran Cross Country Road (NCCR) with a construction budget of P37.218M The project involves the construction of additional lanes on both sides of the existing paved road with a width of 3.35 m., a thickness of 0.28 m. and a length of 1.30 Kms. on one (1) section along Naval-Caibiran Cross Country Road. It includes also construction of drainage and installation of road safety features. Adongay reported that the project is being fast-tracked to finish the project on or before October 8, 2017. As of August 30, 2017, it has an accomplishment of 58%. “I will be consistently monitoring the projects in an alternate schedule without the knowledge of the contractor so as to see if they are doing their job,” said Adongay.